Little brother, big fish!! Wade caught our largest fish of the trip today, a 15 1/2 inch largemouth bass. Big brother, ugly fish!! 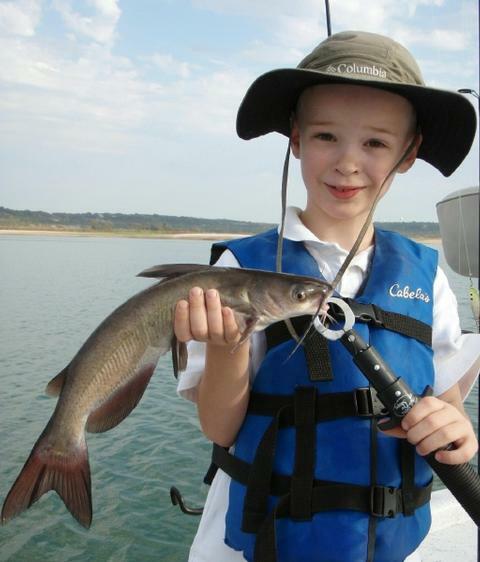 Christopher landed this spunky channel cat that hit, of all things, a downrigged Pet Spoon traveling about 3 miles per hour in 31 feet of water! This morning I was joined around 7 a.m. by brothers Christopher R. (4th Grade) and Wade R.(Kindergarten) of Copperas Cove, TX. Their dad, Lieutenant Colonel James R. is currently deployed for 1 year and is slated to return to the U.S. in July of 2012. Mrs. Karen R. is taking care of the home front including home-schooling the boys, which is what allowed them the flexibility of being on the water with me on this weekday while public school is in session. 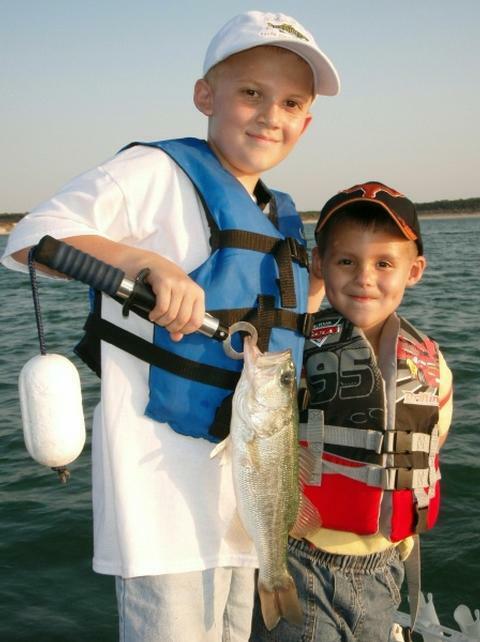 The boys both had very limited prior fishing experience, so, we started with the very basics of safety on the boat, and moved right into how to hold and reel both spinning and conventional tackle. If Wade asked once, he asked 75 times in the 4 minutes it took us to motor through the no-wake zone, “How fast are we going to go?” Each time my answer was the same, “This boat can go about 30 miles per hour, but it’ll feel faster than that because there is no windshield in front of you like you have in a car.” Once I’d cleared the no-wake zone by a minimum of 1/16th of an inch, I throttled up and Wade was thrilled!! Now it was off the the fishing grounds. Today’s hunt began in deep water (40-50 feet) with fish suspended and scattered in a 4-foot band from ~28 to 32 feet deep. I ran the downriggers (two) in this “band of life”, one with a Pet Spoon and one with a White Willow and we began picking up fish regularly. By 8:20a we landed 18 fish including 15 white bass up to 13.5 inches, 1 channel catfish, and 2 school-sized largemouth bass. I could tell the boys were getting increasingly “antsy” in between fish as we waited for our lures to work their magic, so, after fish #18 was swung aboard, we changed up a bit and took our act shallow. We headed over to a deep, still-green weedbed that I haven’t fished in a long time (Area HB002), and was pleased to see all kinds of fish activity through my polarized lenses as we idled around this area. I got us stopped in one place so as to make a steady platform for the boys, and we then broke out the sunfish tackle and pursued bluegill sunfish, green sunfish, and longear sunfish with slipcorks and maggots for a while. As we watched sunfish of all sizes swim by, get brave, and take our baits, we also observed small largemouth patrolling nearby, as well as a nearly 3 foot long spotted gar. With great action, two young boys, and spiderweb line, tangles soon proved to be an issue, so, we engineered a suitable solution in which one brother would fish with one rod long enough to catch 2 fish, while the other brother sat “criss-cross-applesauce” (for us old-timers that is the politically correct term that used to be referred to as sitting “Indian-style”). Once 2 fish were landed, the boys would swap positions and roles and it worked out great!! — Can’t believe I hadn’t thought of that before as I recalled all the time over the past decades I’ve spend untangling kids’ lines! Oh well! Long story short, we put exactly 30 sunfish in the boat here and, by around 10am, the kids were again ready for a change of pace. I headed us uplake and looked around with sonar. We were fortunate enough to have our search coincide with the start of a breeze from the west, as well as some grey cloud cover thick enough to obscure the sun. At the very first area I searched (Area 251), sonar lit up with exactly what I was hoping to see — tightly schooled, bottom-hugging white bass. I e-anchored over top of these fish, and reviewed the jigging techniques I’d instructed the boys on earlier “just in case”. Down went the slabs and up came the white bass, 10 in all, each caught “all by myself” as the boys said!! All I did was coach and unhook fish. We closed out our day with a tally of 58 fish caught and released. By the time this school of fish played out, it was time to meet mom back at the boat ramp, so, we prepped the boat for travel, I again informed Wade exactly how fast we’d be traveling, and we made a beeline to the boat ramp just in time to see the blue Honda minivan pull in to the parking lot. As I accompanied the boys up to the parking lot, I presented them each with a SKIFF tackle box, a SKIFF bracelet, a SKIFF camping blanket, and a brand new lure to decorate their new tackle box with. You’d have thought it was Christmas! Thank you one and all for helping to make memories like this for the kids of our armed forces!! Skies: Skies were greyed over sufficiently to obscure the sun; light level still bright. Zach (L) and Mason (R) with a pair of white bass we downrigged from out of the deep with White Willow Spoons and Pet Spoons. The boys display our largest fish of the trip, a “loner” largemouth I first spotted on sonar ghosting beneath a school of threadfin shad around 30 feet. This evening I arranged to pick up my fishing buddies at the Extraco Bank building in Harker Heights. With restrictions on bringing boats and trailers onto Ft. Hood proper for security reasons, I am not able to go to the doorstep of those kids who live on post any longer. This evening, I welcomed Zach Leonard aboard for his 2nd SKIFF trip. He first came out with me in Oct. 2009 when his dad, Specialist Daniel Leonard was deployed to Iraq. Since then, SPC Leonard returned stateside and headed back to Iraq, this time for 12 months spent at Contingency Operating Base (COB) Spicher working as a medic. Zach, a 5th grader, showed up proudly dressed in his SKIFF ballcap and SKIFF t-shirt that he got back in 2009. With Zach came Mason Andrade, age 5. Mason’s mom and Zach’s mom are friends and so the boys were already acquainted with one another before the trip. Mason’s dad, Sergeant Jason Andrade is currently serving with the First Cavalry Division in Afghanistan and is stationed at Forward Operating Base (FOB) Lightning. He’ll return to the U.S. in July 2012. There’s always a “funny” that happens on these S.K.I.F.F. trips. On this one, Mason, who evidently at age 5 has never read “How to Win Friends and Influence People” asks, 2 minutes into our drive to the boatramp, “Mr. Bob, are you old?”. Well, old or not, I took the kids out in the 100F heat and we proceeded to catch fish. The strong high pressure that has made for some fabulously consistent fishing has moved off to the east over Louisiana, and a SE component to the wind kicked in which always dampens the fishing a bit. We found willing fish, but they weren’t heavily congregated and it took some coaxing to get them turned on. 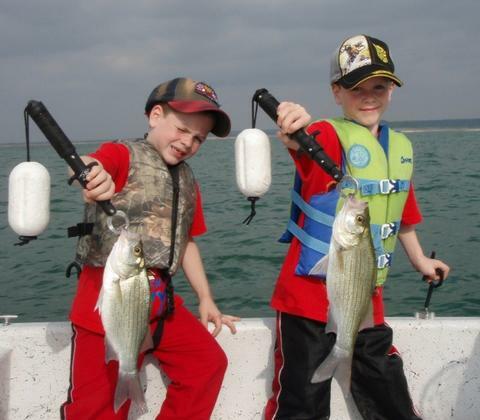 We first went after white bass with our downriggers. I used both ‘riggers tonight, one with a Pet Spoon and one with a White Willow Spoon — both imitate the larger shad size that’s most common right now. We found fish — and caught 6 of them — holding down at 30 feet in an area triangulated by Areas 885, 886, and 887. After a few runs through the already scattered fish, they became few and far between. We headed out to between Areas 871 and 872 and found fish along the deep edge of the breakline here and, using the same tactics as before, brought 11 more white bass and a 15 inch largemouth bass to net. I was hoping against hope that we’d find a school of whites ganged up on bottom, but that east wind just didn’t permit it tonight. By around 7pm or so, I could tell the novelty of downrigging had run its course. We headed to (what remains of) a midlake hydrilla bed at Area 231 and set the boys up with some slipfloat rigs using maggots for bait and got into some sunfish (1 green, 1 longear, and 3 bluegill) before the sun set and the sunfish shut down. We’d now boated a total of 23 fish for the evening’s effort. Stillhouse is now over 14 feet low so I’m now fishing in areas that are traditionally too deep to hold fish (as they would normally be below the thermocline at the areas I’m now fishing). So, each trip is a bit of an experiment, and, fortunately we’ve been able to crack the code on location this summer and stay on top of the fish. Pray for rain!! As we wrapped up the trip Mrs. Andrade picked the boys up and little Mason’s mouth couldn’t move fast enough to tell of all the new things he’d seen, heard, and learned. Zach earned his First Mate certificate tonight helping me keep up with the boat, the wind, the sonar, two downriggers and one really enthusiastic 5 year old! Thank you, Austin Fly Fishers and friends of SKIFF, for continuing to make days on the water like this happen! With school in session now thing get a bit trickier on scheduling trips, but I expect to be able to continue running SKIFF trips on Monday evenings and Thursday evenings right up until the time change in November, and then settle on holidays and Saturdays only for the cold months. Air Temp: 100F at trip’s start. Skies: Skies were fair and cloudless. In the midst of a 47 day run of 100+ degree days, we took a little break from the sun and fun of white bass fishing and did a little bowfishing last night. Trent’s dad displays this THICK smallmouth buffalo he shot weighing in at over 11 pounds. We got out on the water around 8:15pm just as the sun had set in order to give us enough remaining light to do some practice shooting to check aiming pins and work the kinks out of our equipment. I had two shooters with me, my younger brother, Andy, and my nephew, Trent, age 15. Both had bows which is a nice arrangement allowing for both followup shots in the event of a miss, or a double shot in the event of sighting more than one fish at a time. As light faded to dark, we spooked 4 drum off of rocky shorelines, but didn’t see any carp or buffalo until we got off the rocks and moved on to softer bottoms. The shooting was good right up until 10:15 when a wind came up and persisted bringing the trip to an earlier than expected end. We had a good time of shooting before the wind cranked up, resulting in a total of 5 boated fish — 3 carp and 2 buffalo. We had three highlights this evening. First, Trent beat the standing record for the Junior Angler bowfishing category with a common carp he brought in going 8.25 pounds and measuring 24.75 inches. Next, his “old man”, not to be outdone, stuck an 11+ pound buffalo that honestly looked as tall as it was long — almost saucer shaped. And finally, we boated a “double” where the boys shot at two different fish just seconds apart, and managed to land both of them; Trent got his fish while shooting at a quickly moving spooked fish — a really nice shot! Besides the bowfishing we enjoyed spotting deer, raccoons, blue heron, and hearing a multitude of coyotes calling back and forth to one another and yapping. There was other aquatic life to observe, too … we saw all manner of bait fish, large gizzard shad,lots of sunfish, largemouth bass, and one very unconcerned turtle. Congratulations, Trent, on your record. 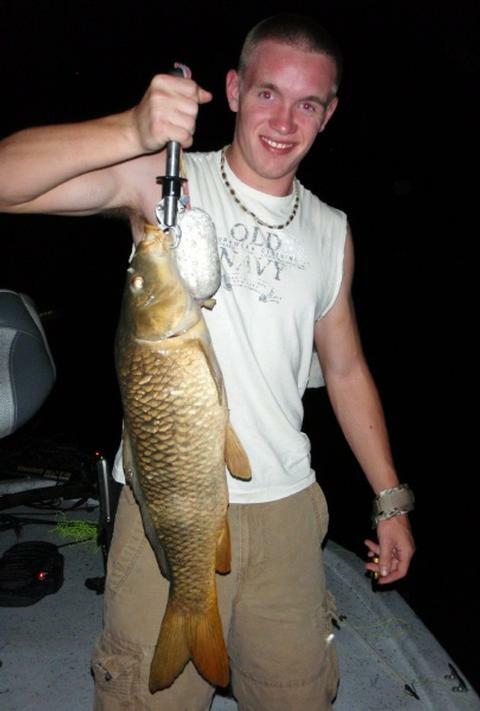 I know you’ve practiced in the backyard a bunch to get ready for this bowfishing trip, and the hard work paid off!! I’m confident you didn’t miss a lick at your 7:00am football practice this morning, or if you did, were wise enough not to let your mom know about it! With sunrise only 20 minutes away, I welcomed Lynn H., his old buddy from church, “PaPa Butch” B., and Butch’s grandkids, 11 year old Leah G., and 9 year old Alexander G. aboard for a fun morning of fishing. Alexander kicked things off with a sassy largemouth that hammered his White Willow Spoon down around 30 feet. Leah’s strong suit was vertical jigging. She needed next to no coaching and was a “natural” at it. 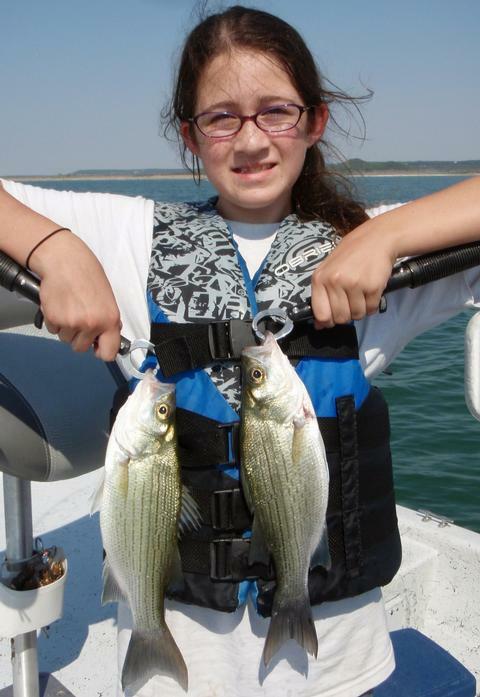 Consequently, she bagged a bunch of white bass using TNT 180’s today. 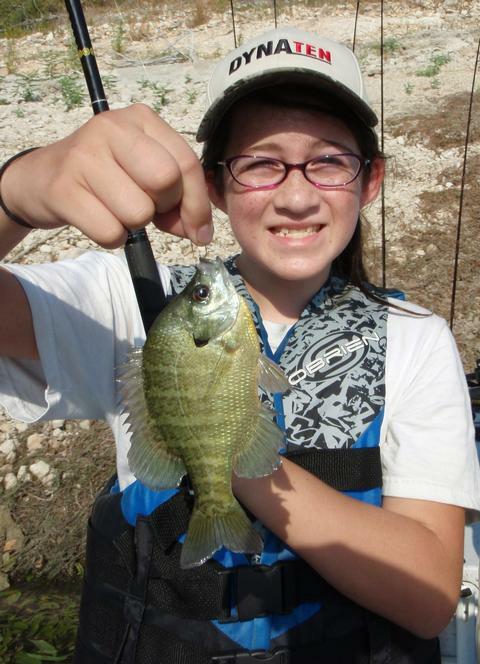 We caught a bunch of sunfish today, both bluegill and greens, and clicked this shot of Leah with a particularly colorful one. The plan was to downrig during the low-light period until around 8:30am for scattered, suspended white bass, then to target sunfish for what has been a predictable “slow period” in the mid-morning for white bass and largemouth, and then finish up strong with some slabbing for white bass in the last 45 to 60 minutes of the trip. I worked with the kids before we left the boatramp area to show them how to use both spinning equipment and the downrigger rods so we could take advantage of all the fish that came our way and not be fumbling when there was a fish on the line. The kids took to both kinds of gear very well and with that lesson complete we were on our way to the fishing grounds. We downrigged the expanse of water from Area 040 to Area 864 and found most of our fish right on or just over the breakline running SW to NE here. We put a Pet Spoon on one rod and a White Willow Spoon on the other rod to match the larger shad now found in this area. By 8:30 we’d boated 22 fish including 21 white bass and 1 largemouth, and the bite was starting to wane. We switched over to panfishing for about an hour or so using maggots on slipfloat rigs to catch bluegill sunfish (26 of them) and green sunfish (3 of them) relating to deep hydrilla weedbeds. By 9:45 the novelty was wearing off of that technique, so we returned to open water. For the last hour or so we searched for bottom-oriented, tightly schooled white bass using sonar. Due to the light winds and bright sunshine, I knew strong schooling action on the surface wasn’t very likely, so we didn’t depend on seeing fish to find them, but rather relied on sonar. At Area 250/884 we found exactly what we were after. We let our slabs (3/4 oz. TNT 180’s in white and in silver halo) down to the bottom and worked up a nice mess of 17 white bass and 1 schoolie largemouth that was hanging out with the big boys. As we approached 11:00am, the kids had all the fun and sun that one morning could bring so, we broke out the snacks, cleaned up the boat, and headed back in with a great morning of fishing to look back and remember as summer break gives way to the new school year ahead. Thanks Lynn and Butch for all your hands-on help and encouragement for the kids!! Air Temp: 81F at trip’s start. Wind: Winds were SSW45 at trip’s start, building to SSW7 by trip’s end. Today David B. of Temple and his boys, Jack (6th Grade) and Jay (4th Grade) joined me to get in one last lick on the fishing before the reality of the new academic year sets in on Monday. From L to R — Jay, David, and Jack “wore ’em out” today!! We had an atypical slow start to our day today, despite darn good conditions — an unobscured sunrise, a light breeze from the SW, and above average fishing the day before. I did note that the waning 3/4 moon was still high in the sky, but, it’s anybody’s guess why the fish do what they do when they do it… The slow fishing allowed us to catch up on things that had happened since our last trip … a vacation to Colorado, whitewater rafting, and David’s newest dermatological discovery: a never-before attempted technique for the removal of skin cancer — alpine sliding!! Anyway, we struggled to put just 5 fish in the boat, all on downriggers, by 9:15 with a 6:55 start time — that’s pretty slow. Two fish came off Area 040/853, and three fish came off Area 875 The boys were troopers, though and watched the downrigger rods faithfully through the tough spell. Things began to take a turn for the better when, at around 9:15, I spotted some light topwater action. I headed to the scene of the crime and found small, schoolie largemouth popping shad on the surface in open water. I found white bass under these fish and so established a hover over the white bass school and quickly switched the rods over to prepare for “slabbin'”. My tool of choice has been the TNT 180 3/4 oz. in “silver halo” — it’s dead on for the size of the threadfin shad right now. From 9:15 to around 11:00am, we “spot-hopped”, spending decreasing amounts of time at each location we found schooled whites at, including Areas 882, 883, 878, 879, 880, and 881, in that order. (BA: 12 AT). By the time the “bell-curve” of the the morning feed flattened out, we’d boated 78 fish on our slabs, including 73 white bass and 5 largemouth. Not a single white bass was shorter than 10.75 inches, and not a single white bass exceeded 14.5 inches. All were healthy — not plump, but healthy. Wind: Winds were SSW5 at trip’s start, building to SSW8-9 by trip’s end. 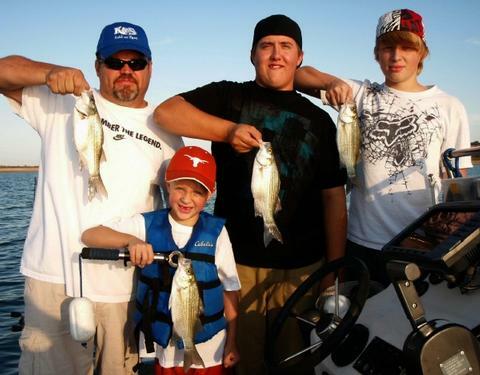 I fished this morning with Kenny B. of Kempner, and his boys Jacob, “Little” Kenny, and Logan. 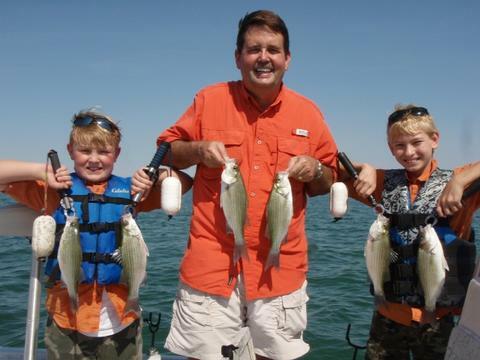 From L to R — Kenny, Jacob, “Little” Kenny, and Logan, all with nice keeper whites, all taken less than an hour into the trip on downrigged Pet Spoons. If I’ve mentioned it once, I’ve mentioned it a dozen times now — this summertime fishing under the influence of strong high pressure makes for some incredibly consistent fishing. The fish are literally doing the same things, in the same places, and at nearly the same times each day. If you’re a regular blog reader and have been thinking about booking a trip, think hard about doing it soon. The kids will be going back to school, football season will kick in, as well as dove and then deer hunting seasons, and the pressure on the lakes will continue to decrease as each one of these factors kicks in. The fishing today was top-notch and I expect it will stay that way at least until the weather breaks. We began our day downrigging between Areas 854 and 040. The fish were a bit higher in the water column today, so we raised the downrigger balls accordingly and were immediately into fish. We boated 13 white bass in under an hour, all while the fish were still suspended and scattered. Around 9:00a the fish began to coalesce and pursue bait more aggressively. We did a sonar sweep around Area 250, spotted fish on the steeper, wind-struck side, buoyed them and went to work. These fish weren’t totally turned on yet but did initially respond well to our slab presentation. We boated 13 more fish here in under 15 minutes and then the action died. We did a little sonar searching with the downriggers in the water so we still had a shot at some fish while I covered water looking for bait and gamefish. We picked up 3 white bass and 1 largemouth in the vicinity of Area 875 in the process before coming across a substantial concentration of fish in the lower 1/3 of the water column right at Area 876. I e-anchored on top of these fish and it was game-on for about an hour’s time. We took our tally from 30 fish up to a final count of 85 fish sitting right on this area, keeping our technique consistent, and putting fish after fish over the side. As for “making hay while the sun shines” … it is very important if you wish to maximize your catch in summertime situations like this to focus on the fishing while the fish are aggressive. This is not the time to snack, joke, take photos, take a leak, etc., etc. 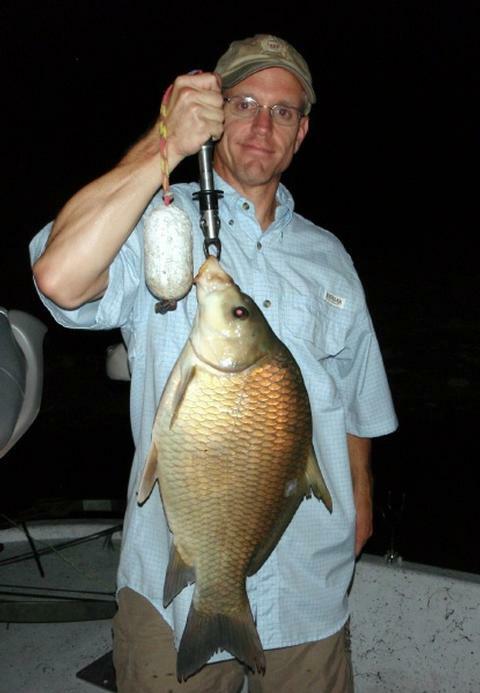 When white bass are hooked, they struggle, the regurgitate what they’ve eaten, and they defecate due to stress. All of this commotion, scent, and vibration turn the other schoolmates on. If you keep catching fish, you keep the momentum going and will keep catching fish as long as the “feeding window” is open. Most fisherman I observe will catch a fish, fool around unhooking it, getting it in the livewell, etc. and drift off their spot only to return to it minutes later only to find the bite has cooled off. Anyway, we boated 49 white bass, 1 freshwater drum, and 5 largemouth bass off this patch of bottom less than 60 feet in diameter. It was at this point that the fellows got competitive and the trip took a humorous turn. First came the comparisons … something like “I think we’ve done better over on THIS side than ya’ll have done on THAT side of the boat.”. Next came a defense … something like, “Oh no, we’ve done much better on THIS side.”. Next came scorekeeping … “Okay, we now have 8 on this side to your wimpy 6 on that side.” Fabrication followed … “Well, overall this side has caught at least 3 dozen, and they were all big ones!”. And so it spiraled out of control until finally, I was asked to step in and referee. All I had to go off of was my “tells-no-tales” fish-clicker, and it read 85 fish for the TEAM effort. That seems to quell the disturbance (a bit). By 10:50 the feeding frenzy had ramped up, peaked, and fallen flat and I knew to persist would be anticlimactic, not to mention very hot, so, we wrapped ‘er up right there and headed on in. Wind: Winds were S4-5 at trip’s start, building to SSW8 by trip’s end. This morning I was joined by 3 young people — 10 year old Lauren Vieth and 8 year old Zachary Vieth both from Ft. 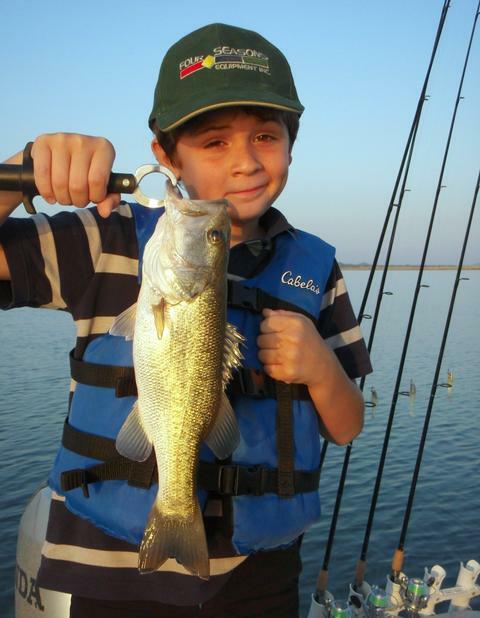 Hood, TX, and 13 year old Colton Verdine of Salado, TX. The Vieth’s dad, Major Craig Vieth, is currently serving in Afghanistan with the 1st Cavalry Division at Bagram Airfield. Colton’s dad, Staff Sergeant Verdine, is deployed as a National Guardsman out of Camp Mabry, Austin, and is an infantryman now stationed in the Ghazni Province of Afghanistan. The moms got the kids to the boatramp on time, about 15 minutes before sunrise. This allowed us to take our time getting goodies stowed, work our way through the no-wake zone, and do some hands-on training with both spinning and conventional tackle before the sun rose and the fish started working. We remain under the influence of a strong high pressure system and that made for clear skies, light winds and high temperatures today. The fish have been behaving in nearly identical patterns for over a month now, and so again today we got right on top of the fish without having to do much probing or searching with sonar to make it happen. We decided we’d use the downriggers first to find and catch fish, and, if we found any heavy concentrations of fish, we were already practiced at jigging for them. We went in height order, from smallest to tallest, so Zachary, then Lauren, then Colton took turns on the dual downrigger rods equipped with Pet Spoons. We had a very productive first two hours, catching fish consistently throughout this time, and boating a total of 29 fish, including 26 white bass and 3 largemouth. These fish came from between Areas 854 and 863. Lauren (reluctantly!) 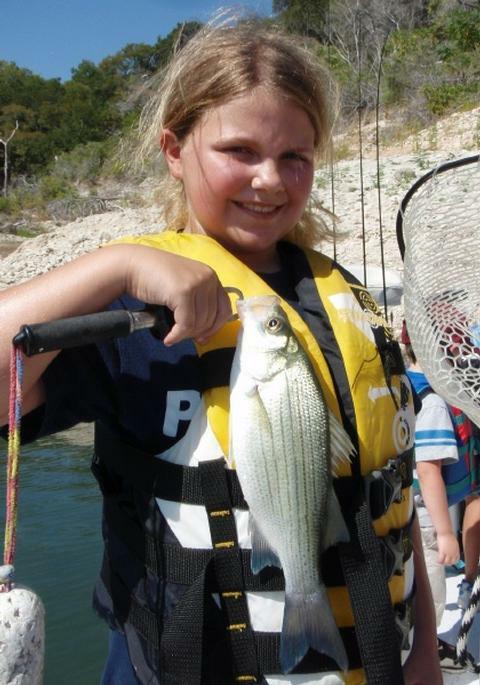 holds her largest white bass of the trip without the help of a Boga Grip! 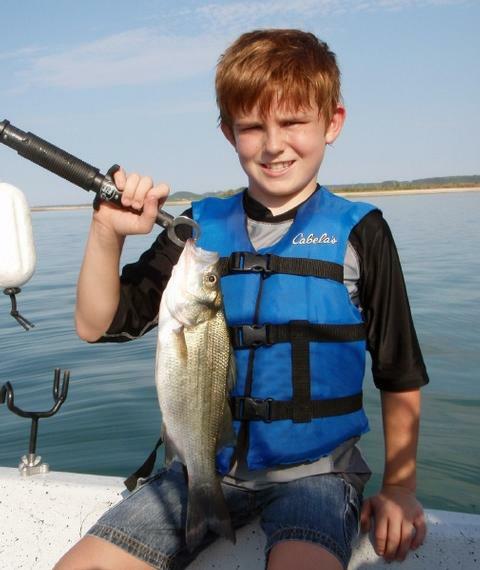 Our first fish of the day, landed by Zachary, took Texas Parks and Wildlife Department “Big Fish Award” honors (set at certain lengths for certain species) by surpassing the 15 inch mark with his white bass that measured 15 5/8 inches! 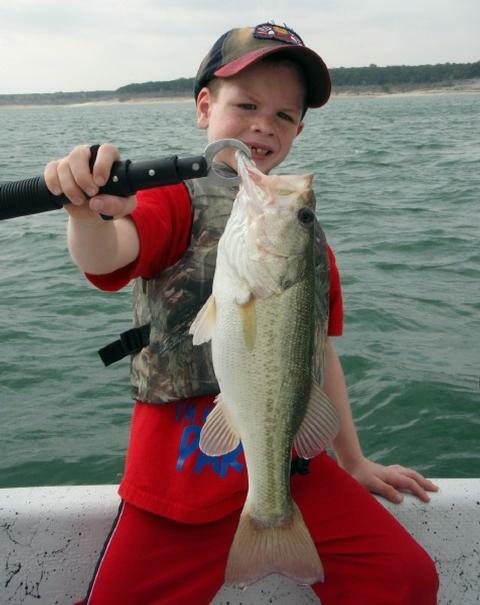 Later, Colton boated a chunky largemouth that eclipsed the 2 pound mark, so, we had a nice mix of quality and quantity. By around 9:10, the light SW breeze we had went dead and it became very hot, very still, and very bright — not a good combination for white bass. We struggled for about 40 minutes trying to get back on fish. I knew this was an uphill battle without some wind blowing, so, by 10:00, with no winds on the way, we changed over to fishing for shallower panfish and hunted up some sunfish over some deep-growing hydrilla beds. The kids got the hang of the slip float technique I showed them in no time at all and in about 45 minutes time on our first and only hydrilla bed, the kids landed 24 sunfish (23 bluegill and 1 green sunfish). These fish came off of Area 231. So we had a great “opener” and great “closer” and everyone returned to the dock and to mom very enthusiastic about our adventure. Mrs. Vieth showed up first to pick up Lauren and Zachary. As they headed out of the parking lot, Colton gave his mom a call on her cell phone to check on her arrival time. That’s when we noticed several “wolfpacks” of largemouth bass driving shad to the surface about 100 yards away from the us (Area 199). It was hard to miss on the now-glassy surface. I looked at Colton and he knew exactly what was going through my mind — WE NEED TO GET OVER THERE! So he hopped in, I shoved off, we motored near the fish, and cut the outboard and trolled into them to keep from spooking the fish. We then fired casts with swimbaits into the frenzy and put an extra 4 fish on the tally as a result of our 11th hour efforts. The following photo is NOT staged. 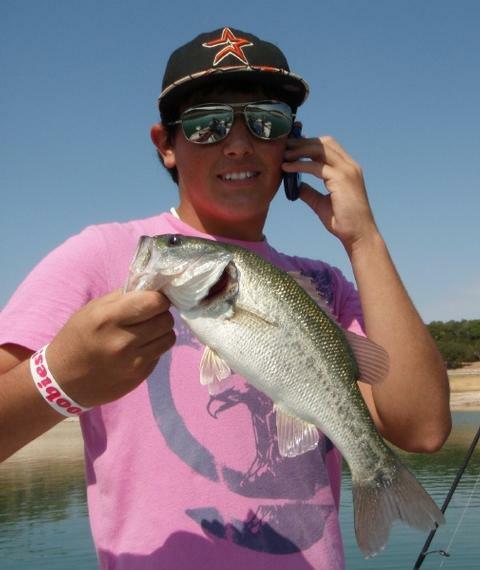 It shows Colton, with a bass he just landed out of a school that blew up on topwater, talking on his cell phone with his mom, asking if we could stay another 10 minutes longer to fish for the schooling largemouth!!! The action died off pretty quickly as it often does under windless conditions, and we headed back in for keeps, now with a total of 57 fish instead of 53!! Read the paragraph above for details on the cell phone!! As I try to squeeze in as many SKIFF trips as I can before school goes back in session, I appreciate all of you who have helped contribute the pieces to make this whole greater than the sum of its parts. You’ve helped with rods, reels, tackle, sonar, line, funding, mementos for the participants, notes of encouragement to me, and more. This is a great relationship and makes a real and positive impact here in the Fort Hood area. Thank you all!! The S.K.I.F.F. 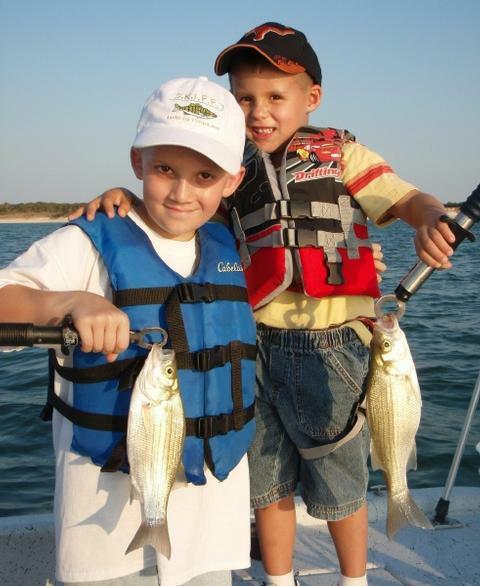 (Soldiers’ Kids Involved in Fishing Fun) Program exists to take the children of deployed or deceased soldiers on fishing trips at no charge to the soldiers’ families. As the moon (to the right of Braden’s ear!) 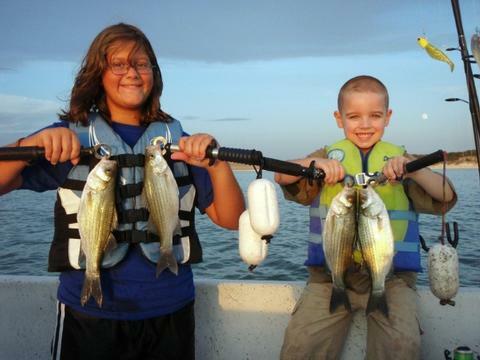 rose and the sun set, the fishing tapered off very quickly, but not before both kids loaded the boat with white bass and a few largemouth this cloud-cooled August evening. 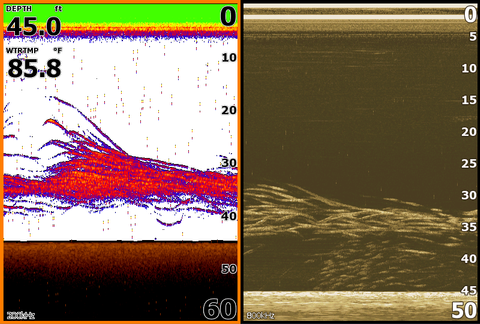 This is a side-by-side screen shot showing a sonar (L) and DownScan (R) image of the huge school of white bass we hovered over for nearly and hour. This school numbered several hundred individual fish. On the left half of the screen, the massive school is the collection of red “streaks” at between 30 and 40 feet deep. This school was nearly 8 feet thick and about 20 yards in diameter!! This evening I fished with Rebecca Knowles (6th Grade), the daughter of Chief Warrant Officer Jay Knowles and his wife, Susan, and with Braden Eldridge (Kindergarten), the son of Captain Kyle Eldridge and his wife, Caitlyn. 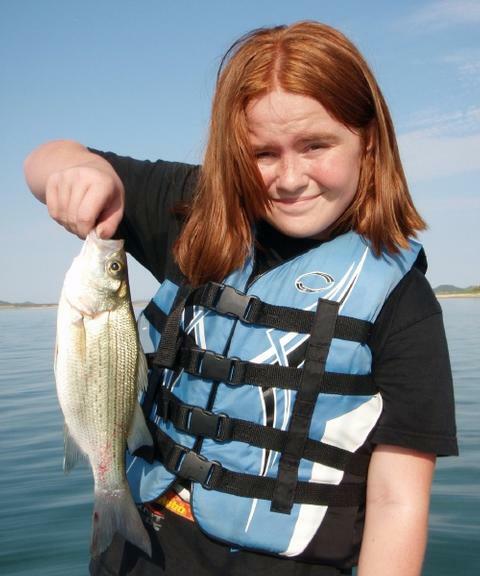 Rebecca not only saw her dad head to Afghanistan this past month, but earlier today sent her oldest sister off to Texas Christian University, so, we planned a pick-me-up fishing trip to help keep her spirits up. 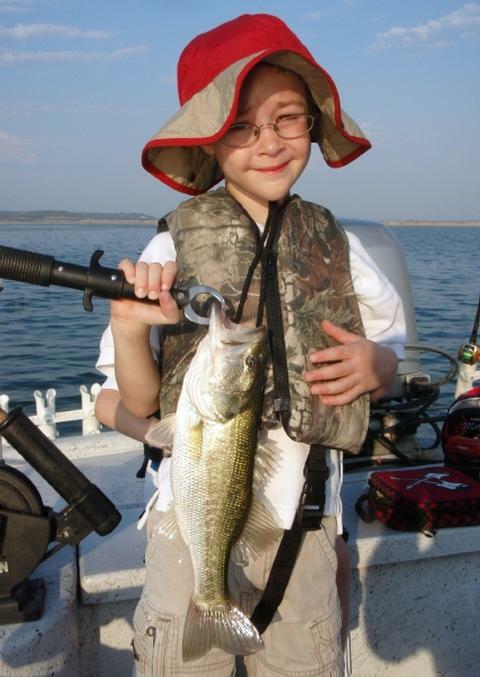 As for little Braden, he’s been wanting to go fishing for a while, but wound up breaking his arm up near the elbow a while ago and was on “no fishing” status for about 6 weeks as he mended from that injury. Braden’s dad, Kyle, is currently stationed at Contingency Operating Site (COS) Marez in Afghanistan with the 5/82 Field Artillery as a battery commander. CW4 Knowles is stationed in Kabul and will look forward to retirement shortly following his return from this deployment. I looked ahead at the weather for this weekend and saw a lot of turbulent activity headed our way from the west and decided to bump this trip up a few hours to Friday evening ahead of what could be some stormy weather for Saturday morning. As it turned out, a small disturbance that dropped a bit of rain on Lampasas county passed to the north of us during our trip. The grey clouds on the southern edge of this system covered the sun for us and dropped both the light level and temperature substantially. The grey conditions coincided with some great fishing. We got right on the fish less than 10 minutes into the trip right between Areas 868 and 870 using downriggers rigged with Pet Spoons on the business end of the line. Braden took the first crack at the fish and then he and Rebecca took turns thereafter, boating 18 fish in the first 90 minutes of the trip. This catch consisted of 15 white bass and 3 largemouth. Things then went soft here as the winds slacked off and we experienced a lull until around 7:00pm when the winds began to pick up again, this time from just W. of S.
At this time, I searched with sonar along a breakline which is normally too deep to hold fish, but, with Stillhouse down over 12′, things have changed and I found a great many fish suspended just off the face of the slope here at Area 871 to 872. The fish were so thick (see sonar screen shot) that 3 out of 5 times we dropped our slabs down towards bottom, the fish would strike the slab before it reached the bottom. This was easy fishing for the last hour of the trip, and just the scenario you’d hope for with a 5 year old on board. The fish were so active and competitive in this heavily schooled situation that technique really didn’t matter. If a bait got to the right depth and moved, it was going to result in a hooked fish! We boated the balance of our fish right at this area — 30 fish in all — until the fish stopped as the full moon rose, right at sunset. One little “funny” on the way home … I had the radio tuned to “KLOVE”, a Christian radio station. Rebecca listened for a while and asked if we could put it on “AIR-1” because it was a Christian radio station. I let her know that the station I had it on was a Christian station. To that she said something to the effect of, “Yeah, but they play old songs that mainly old people listen to.”. I just grinned and pushed the button! I got to speak with both moms before and after the trip and both were anxious to get this summary so they could pass it on to their husbands. Mrs. Eldridge was going to use the downtime during our trip to get some “honey do’s” done in advance of Captain Eldridge’s return in a few short weeks, so she was very appreciative of the opportunity this trip presented for both her and Braden. Thank you all for your support to both our soldiers serving in harm’s way, and to their spouses doing double-duty as mom and dad for a year a time. Air Temp: 96F at trip’s start. Wind: Winds were S13 at trip’s start, settling slowly down to near calm at sunset. Skies: Skies were entirely overcast as the southernmost edge of a storm system that passed to the north of us obscured the sun, cut the heat, and sparked some good fish activity. This morning I picked up 6 1/2 year old twin brothers Kevan and Kristian from their home in Killeen and they were ready to go fishing!! Twins Kevan (R) and Kristian (L) paid attention to detail in their technique and were rewarded with a quality catch of 59 fish today! Kevan and I pose for cameraman Kristian and show off a potbellied largemouth. Kristian conquered his fear of holding fish and shows off this nice black bass all by himself, even if it is at arm’s length! The boys’ live with their grandparents, but right now “Pop Pops” is deployed to Afghanistan with the 615th Air Cavalry, so “Nana” Tina signed them up for a fishing trip with a ride to the boat ramp included! On the way to the lake we got to talk about how it was to be twins, what they thought their 1st Grade year in school would be like, how karate lessons had just ended, and about how they enjoyed the ice cream at Vacation Bible School. We got to Stillhouse and had the lake to ourselves. Between the low water and high temperatures it seems like all the other fishermen have given up on things. As we got going this morning, things were kind of slow in the vicinity of Area 040; we picked up two fish on the downriggers at Area 517, two more at 040, and little else. This wasn’t helped by the fact that the totally overcast skies kept the sunrise bite, which is normally triggered by the suddenly increasing light levels, from happening. Eventually the fishing got going, and we managed to find plenty of action to keep the boys’ mouths smiling and their hands busy. Today’s action was atypical of this summer’s action on Stillhouse thus far, as we caught far more fish by slabbing than we did on the downriggers. Our best success came at 2 of 3 anchorages that we made. We hovered over Areas 867, 868, and 869, and caught the majority of our fish at Areas 867 (32 fish), and 869 (16 fish), with only two boated (but many more lethargic fish seen on sonar) at Area 868, and 4 more fish picked up on downriggers between Areas 868 and 869. I’ve fished with a lot of younger elementary-aged kids over the years, but these boys were among the quickest 6 to 7 year-olds to catch onto the slabbing techniques we used today. 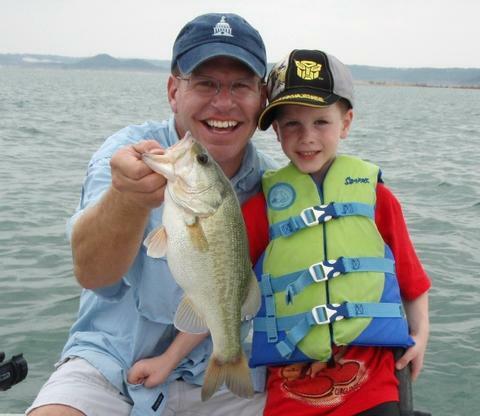 Granted, there was still a learning curve, and it took a lot of repetition and hands-on examples, but, by the end of the trip both boys were catching fish consistently and independently — I was really proud of them for that. All of our slabbed fish came on TNT 180’s in 3/4oz. and in the colors white and silver — both doing equally well with the grey but bright conditions. Our downrigged fish all came on Pet Spoons. 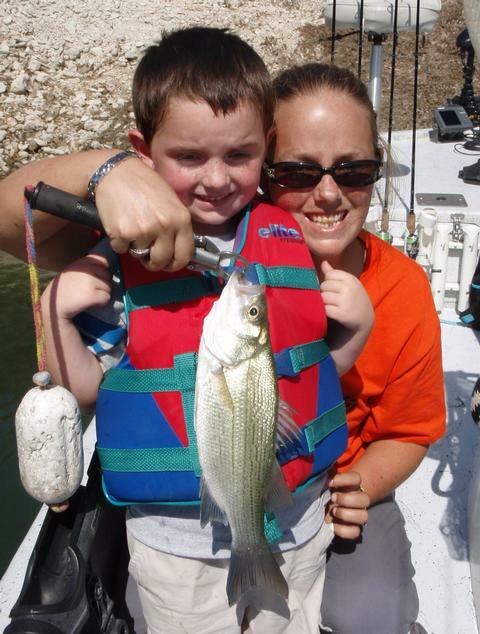 We ended today’s trip with 59 fish boated including 55 white bass, 3 largemouth bass, and 1 drum (BA: 5AT). On the ride home the boys made sure I was up to date on all the current happenings in the world of “Transformers” and I got a fairly good technical description on how to be successful while playing “Halo 3” in case I ever want to try that. Air Temp: 79F at trip’s start. Wind: Winds were SSE7 at trip’s start, building to SSW11 by trip’s end. Skies: Skies were 100% greyed over with a low layer of clouds and no direct sun shining the entire trip. This morning I had the pleasure of fishing with Mrs. Seanna H. and her 3 children, Hadley, Kerstyn, and Audric. Hadley, being a great big sister, volunteered to be the last of the three kids to take her turn battling a fish. 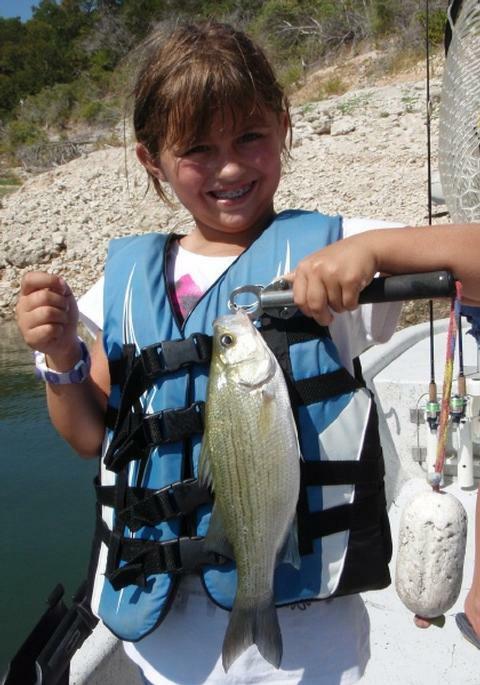 Here is a one of the white bass she caught. Kerstyn was our cheerleader; she was bubbly, full of energy, and ready pitch in and do whatever she needed to be done so we could keep on catching fish. Audric stayed engaged much longer than most 5 year olds as I tried to “mix it up” using a variety of different techniques spread out over the span of the 4+ hour trip. All four are anxiously awaiting dad’s return from his 1 year long deployment to Iraq. During our trip, and despite the 16 hour time difference, we actually got to speak with him by phone and send near-real time Facebook photos of our catch directly to him while we were still on the water!! As our day began, we got everyone fitted with lifejackets and went over all the safety considerations. We also got to practice a “jigging” technique that I hoped we’d get to use later in the trip. Then, it was time to launch. We headed to the fishing grounds near Area 040 and found things a bit tougher than they’ve been of late. Today’s weather was “off” from the cookie-cutter weather we’ve had for the last 3 weeks in that we had abundant low cloudiness and a stiff wind this morning versus the near-cloudless and near-calm conditions we’ve had over the past weeks. We had to work for the fish today, but caught plenty and caught them consistently, so the kids stayed enthusiastic the entire trip. At first, we downrigged, finding most of our fish from Area 041 thru Area 864 and thru Area 863. Downrigging is a form of controlled-depth trolling that very precisely places a lure at the depth at which fish are seen on sonar. In all, over the first two hours of the trip, we boated 17 white bass, all of which were of legal size, with most going 12.5 to 13.75 inches. As we moved along covering water by downrigging, I kept a close eye on the sonar, looking for tightly-schooled bunches of fish on or near bottom. Around 8:45am we found such a school of fish in 32 feet of water, right at Area 866. We put into practice the jigging skills we’d learned at the boat ramp, and each child got to land at least one fish on the TNT180 3/4 oz. slabs we were using before the school swam off, never to be relocated. Our fish count now stood at 21. So as to introduce the kids to a form of fishing they could enjoy just about anywhere, and without requiring the use of a boat, we set aside the last hour of the trip to fish with “poles” without reels, using very sensitive balsa floats with maggots for bait. In about an hour’s time the kids caught fish continuously from out of a deep hydrilla weed bed we had stopped near. In all, the kids landed 23 bluegill sunfish and 1 green sunfish at this location. By 10:45, little Audric had “hit the wall” of his attention span and looked like he could either get real grumpy real fast, or take a long nap, so, we called it a great day right there, took some photos, and headed back in to the ramp. Air Temp: 82F at trip’s start. Wind: Winds were SSE12 at trip’s start, building to S14 by trip’s end. Skies: Skies were fair with 20% low grey clouds this morning, gradually and totally clearing.